Note: On Saturday, my wife (Andrea) and I flew Hawaiian Airlines Flight 50 HNL-JFK on our way home from our Hawaiian vacation. About 3 hours into the flight, there was a medical emergency on board and the flight attendants asked for any doctors or nurses onboard. Since my wife is a registered nurse (RN) in the Cardiothoracic Intensive Care Unit (CTICU), we jumped into action to help the ill passenger. Here is our firsthand experience of what happened and what I learned about medical emergencies on a plane. This flight started off like almost every other flight we’ve taken and about 3 hours into the 9 hour, 15 minute flight home we were comfortably lounging, watching Horrible Bosses 2 after dinner. We were sitting in 1A & 1B, unaware of the commotion behind us in row 15 until a flight attendant asked for any doctors or nurses onboard. Andrea is a CTICU nurse who jumped up to help & I accompanied her in case I could help in any way (for the record, I have no medical certification). Upon arriving at the passenger in row 15, it was very obvious an older man (we later found out he was in his 70’s) was in severe distress. The thing I noticed were his eyes, which appeared slightly rolled back in his head and he seemed disoriented. His breathing was extremely labored, his shirt was pulled up exposing his stomach and you could see his chest & stomach expand greatly as he tried to breathe. He could not speak nor was making any other movements outside of his labored breathing. 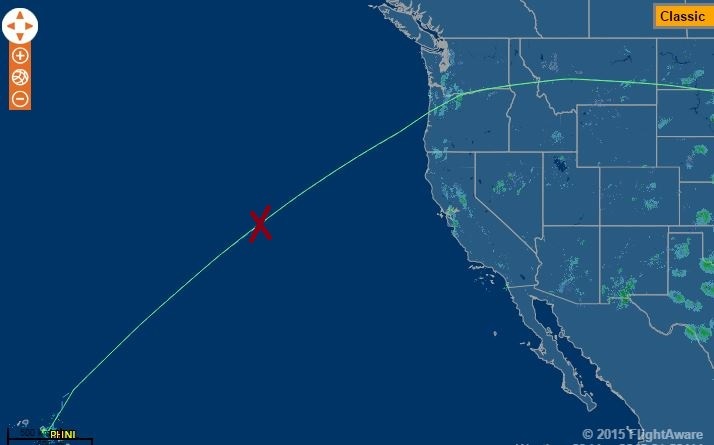 I should note at this point we are at least 2 hours away from land, as I’ve approximated our position on the map below (the flight path below was our actual flight path on 5/2 per FlightAware). The first thing Andrea asked for was oxygen which a flight attendant had ready for her. After placing the oxygen mask on him (which was connected to a small handheld device), a doctor identified himself and began working on the passenger with my wife. A flight attendant passed the doctor a stethoscope and he proceeded to listen to the passenger. He then asked for a blood pressure cuff and took that reading. His blood pressure was 180/100, which was extremely high. This set off a chain reaction with the flight attendants, as one rushed to call the captain, another got the medical kit and my wife turned to yet another one and asks for the defibrillator to be brought to us just in case. The passenger’s son found a list of medicine his father took (very smart of him to travel with that list) and asked the doctor if he wanted any of those meds if he could find them. At that time, I was surprised to see a large and very complete looking medical kit arrive from the flight attendant. Inside it was color coded with a sheet listing all the medicine by color group in the bag. The doctor was looking for nitroglycerin and began looking for it in this large kit. All of a sudden, the ill passenger for a lack of better word appears to have “come to” and jolts up in his seat and is now responsive. The doctor quickly assesses his vitals, takes his blood pressure, asks him to squeeze his hand and some other basic commands. He is appearing to look much better now and the doctor holds off on giving him the nitroglycerin. The son comes back and states this “occasionally happens to his father when he goes too long without a cigarette”. Well, sorry giving him a cigarette isn’t an answer at this point! The doctor continues to monitor him for the next 5-10 minutes and the patient rapidly appears to be returning to normal again. In fact, he is slightly agitated at the oxygen mask still on him and wants it taken off. A flight attendant then came over and told the doctor the captain would like to speak with him (presumably whether we still needed to divert and make an emergency landing). We were unfortunately not apart of that conservation so I don’t know what was said or how they arrived at the conclusion to not divert. At this point, there isn’t much more for the doctor or Andrea could do. The doctor suggested there might be some underlying condition with his heart or lungs that caused the labored breathing but it appeared to have passed for now. He proceeded to watch him for another 15 minutes or so when we all finally went back to our seats and tried to enjoy the rest of our flight. The captain chose not to divert based on his conservation with the doctor (which again we were not privy to) so we continued onward to JFK. Once back in our seats, we were asked to fill out an incident report detailing the situation. We also got another form to fill out from Hawaiian so they could contact us afterwards. Thankfully, the rest of the flight was uneventful though both Andrea & I definitely took a few looks towards row 15 to make sure everything looked ok. Upon landing at JFK and arriving at the jet bridge, the crew held all the passengers back as an EMS team came on and pulled that passenger off the plane into a wheelchair. 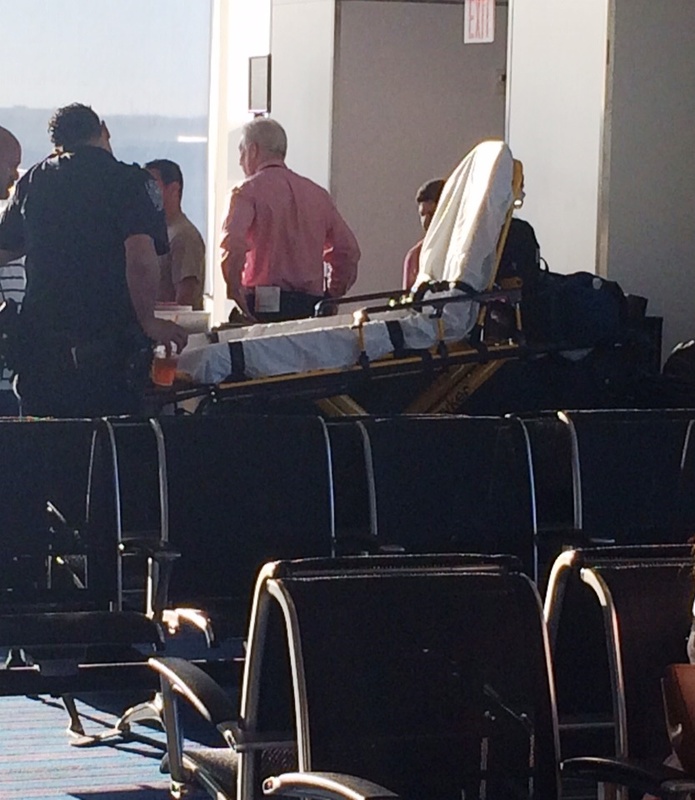 Once we were able to deplane, I saw the passenger recounting the events with EMS add several police officers as well. They had a stretcher ready to presumably take him to the hospital though we do not know what ended up happening, We were not asked to stop or talk to anyone though we did see the son and wished him the best of luck with his father’s health. I was very impressed by the medical kit that Hawaiian had onboard. It was much more comprehensive than I expected (I was expecting a small little first aid box for some reason). This makes me feel more comfortable and confident should anything happen to me on a flight. In that medical kit, there are intravenous medicine which I was shocked to find. I assume this would require a qualified profession to insert an IV into the ill passenger (which is no guarantee to have on a flight), so I was shocked they would even carry an IV kit and applicable medicine. I guess it can’t hurt to have this, so again another positive. I think it is a great idea to carry a list of all the medicine and medical conditions you have so someone could better assist you if necessary. I plan on doing this going forward. There was a ton of paperwork – both my wife and doctor filled out a report and after the flight when EMS personnel met the passenger, I saw them looking him over and asking a lot of questions after the flight. 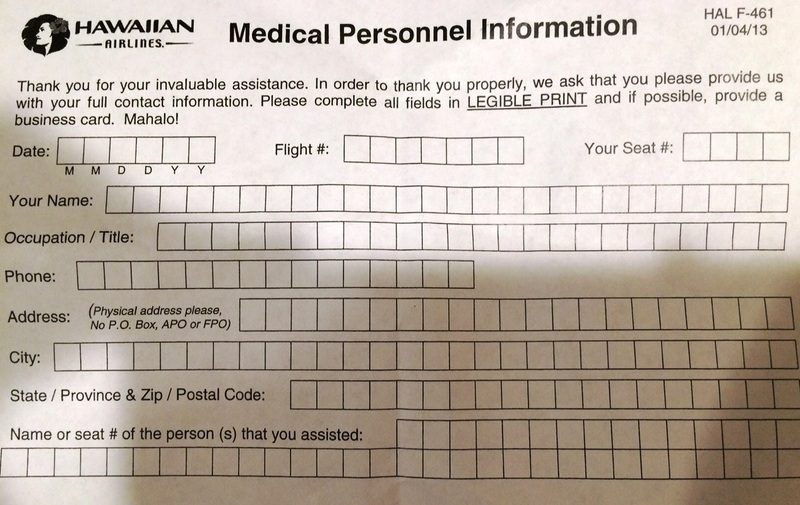 The airline take your help seriously – we were each given the following form so Hawaiian could say thank you and were told to expect contact from a Hawaiian official within a few weeks. I’ve never experienced firsthand a medical emergency onboard before this and I hope to never again. I definitely was (pleasantly) surprised by how prepped the airline is and I can only hope other airlines are as ready as Hawaiian. I’m glad my wife and the doctor onboard were able to help the ill passenger and I can only hope that all nurses/doctors onboard would make the same decision to help a fellow passenger. I’m very happy to hear you were thoroughly impressed with how emergency situations are handled on the flight. The inflight crew, first and foremost, is there for your safety… and then to make your inflight experience comfortable. However as a former flight attendant, I was less than thrilled with their protocols. First off, the crew still did a good job, but some things need to be changed to facilitate a more efficient workflow (especially when time is of the essence). 1) In an emergency situation, one flight attendant should remain with the passenger and asking around whether or not they have family/friends traveling with them, their name, DOB, health conditions, and medications. That’s basic information that should be collected while another flight attendant informs the flight deck crew and makes a Passenger Announcement asking for medical assistance from a doctor or nurse. 2) Lights should be turned on already – if this was an emergency situation. 3) ALL medical kits, at least 1 oxygen bottle, and defibrillator should be brought to the scene right away. There is no waste of time. If the equipment is not required, then it can be put back later. They shouldn’t have been brought to the scene AFTER the medical personnel asks for it. There are two types of medical kits that are onboard the flight. There should be a couple of First Aid kits for more general and non-emergency situations and then one main fully stocked Medical Kit where all sorts of medications, IV meds, and minor surgical tools can be found. These are generally very standard throughout most airlines – and I’m sure with it rarely seen by the general population, it is quite impressive. Wait till you see the RESTRAINT KIT we have for obstructive passengers! Again, let me reiterate that the crew still did great and with the help of your wife and the doctor, they were able to stabilize the passenger and save his life. However, they need to reassess and perhaps change their Emergency Scene Management protocols. If my crew did what this crew did when we had our heart attack passenger, he wouldn’t have survived with all the waiting around for the emergency equipment. Just my 2 cents. Wow, thank you for an insider’s take. As you mentioned about the general public not being totally aware of these situations, I was surprised- in a good way to see all that equipment. I’m glad the protocols and equipment is very well thought out, even if our crew didn’t proceed properly. Wow and they thanked you by requiring you to fill out paperwork. How magnaminous of them. Make no mistake, that’s so if things went wrong with the guy they could shift blame from themselves and throw you under the bus. Trust me, I’m an MD and I know MDs that refuse to identify themselves on a plane for this very reason. Good samaritan laws only go so far….